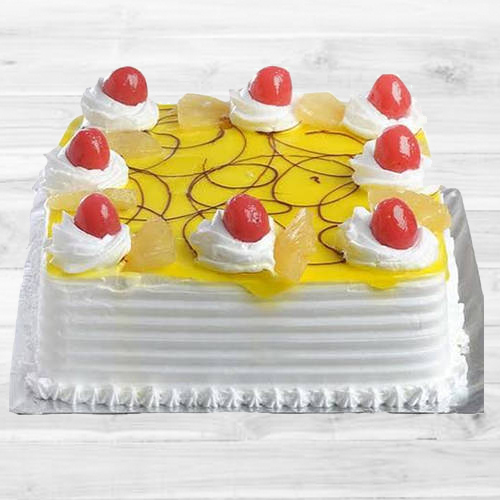 Tell your loved ones how much you love them by gifting this Precious 1 Kg Eggless Pineapple Cake. Convey your feelings of love to your loved ones by presenting this Garnished 1 Kg Eggless Vanilla Cake. Try out something special by gifting this Exquisite 2.2 Lbs Eggless Strawberry Cake to your dear ones. Make your loved one s day by delivering this Sublime 1 Kg Eggless Black Forest Cake. Present to your beloved this gift of Energetic 12 Red Roses with 1 Kg Eggless Pineapple Cake and create magical moments to cherish forever. Celebrate any event in a greater way with this Delicious 2.2 Lbs Eggless Plum Cake from Taj / 5 Star Bakery.